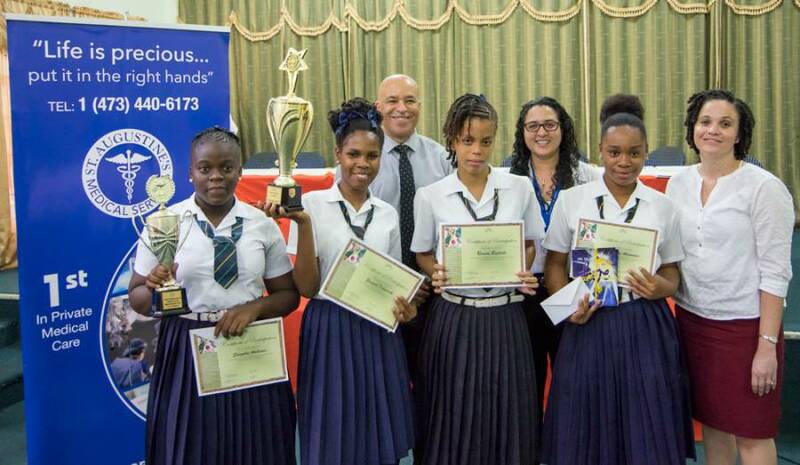 The Bishop’s College was named the champions of the 12th Annual Food & Nutrition National Quiz Competition, at the close of the tournament finals which was held at the Grenada Red Cross Building Conference Room on Thursday, 21 April. The preliminary rounds of the competition were held on 14 April, when 11 secondary schools competed against other institutes, in their respective zones, for a chance to enter the quiz finals. On 21 April, the winners from each of the 4 zones — East, West, South, and Carriacou — faced off against each other in several rounds of intense competition, with the goal of being named the victors of this year’s event, and taking home the coveted challenge trophy. St Joseph’s Convent St Andrew represented the East Zone; Anglican High School the South Zone; St John’s Christian Academy the West Zone and Bishop’s College represented the sister isle of Carriacou. 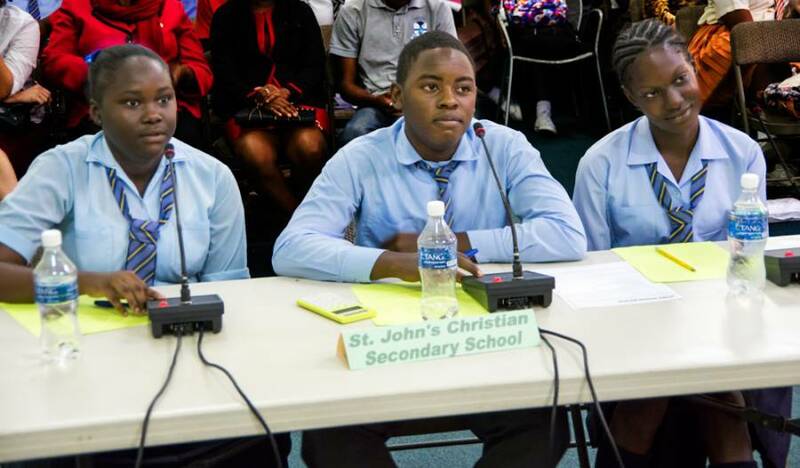 At the end of the 3rd round, St John’s Christian Academy was ahead of the other schools with a total of 70 points, however, Bishop’s College — in an amazing comeback — took the lead with 80 points at the end of the 4th round and held their place until the end of the 5th and final round. Mr Selby Henry, Chairman of the Grenada Food & Nutrition Council (GFNC) congratulated the students on the level of knowledge they displayed and on the additions made to this year’s competition “The competition usually receives excellent participation from the schools that have Food & Nutrition as part of the curriculum. This year’s competition included a notable change, whereby the food & nutrition teachers were asked to submit questions that were relevant to the CXC syllabus. This was an important addition to the quiz, as one of the aims of the competition is to help students prepare for their regional exams usually held in May/June” he stated. For the 3rd year in a row, St Augustine’s Medical Services (SAMS) showed its support for the quiz and health education, through sponsorship of the event. Dr Lutz Amechi, Resident Physician, and owner of SAMS attended the event, and congratulated all the students on what he believed to be an admirable display of knowledge and sportsmanship “Food & proper nutrition are required for us to live healthy lives and are very important in the healthcare industry. I would like to applaud the efforts of the students who displayed a wealth of knowledge in the subject, and encourage them to implement what they have learned in their everyday lives. This subject (Food & Nutrition) is one of the qualifying subjects for a number of careers in the healthcare industry, which is continually growing” he commented. Dr Amechi commended GFNC for coordinating the quiz and once again pledged the support of SAMS for the next event in 2017. At the prize giving ceremony, all students who competed in the quiz received certificates of participation. The finalists received a number of prizes which included vouchers from the Marketing and National Importing Board (MNIB); Marker’s School Supplies and Bryden & Minors. Trophies were presented the top three placing schools as well as a challenge trophy which was returned to Bishops College, the winners of last year’s competition. Local Graphic Design and Marketing Company, AllyDay Creative Projects, closed the ceremony with a special presentation of a nutrition based book called “It’s Your Life” to the finalists. The book which was designed and published by the company, was authored by resident spa operator, Hazel V Dawson in 2013. Alleyne Gulston, Creative Director and Co-owner of AllyDay commended the students on a job well done, and encouraged them to continue using the knowledge and skills they learned while on their journey. In closing, Lishelle Murray, Communications Relations Officer for GFNC thanked the students and teachers for their keen participation as well as the sponsors of the event — St Augustine’s Medical Services, Bryden & Minors Ltd., Poli Natural Spring Water, Markers, AllyDay Creative Projects, Cathwills Stationery and Uptown Mini Mart — for their continued contribution towards the success of the event.